Never leave your Firefox browser unattended with your password keyed in. Your password can be stolen even before you know it. Note that the code below could be wrapped due to width/space constraints, the original code is on a single line. 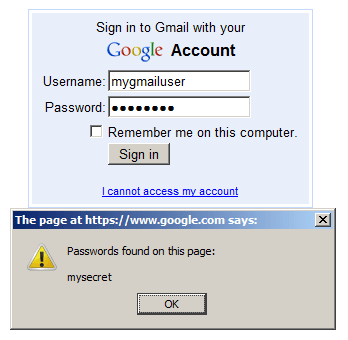 You will get a popup message revealing all the hidden passwords for that page. This trick also works on Google Chrome. Updated (30-Mar-2015): Updated procedure for Firefox.